Lakeland, the home of all things kitchenware, has been hacked. In a email sent to customers yesterday, it reported it had suffered a "sophisticated and sustained" attack, with the hackers gaining access through a "very recently identified" Java flaw. Potential security breach of Lakeland website. 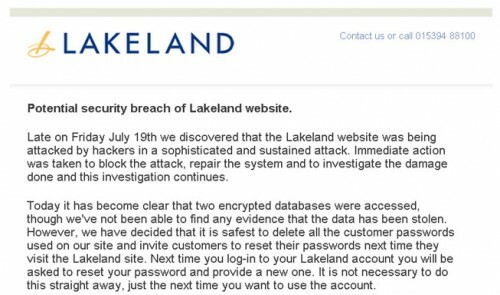 Late on Friday July 19th we discovered that the Lakeland website was being attacked by hackers in a sophisticated and sustained attack. Immediate action was taken to block the attack, repair the system and to investigate the damage done and this investigation continues. Today it has become clear that two encrypted databases were accessed, though we've not been able to find any evidence that the data has been stolen. However, we have decided that it is safest to delete all the customer passwords used on our site and invite customers to reset their passwords next time they visit the Lakeland site. Next time you log-in to your Lakeland account you will be asked to reset your password and provide a new one. It is not necessary to do this straight away, just the next time you want to use the account.